The Air Force is taking a page from the Cold War playbook to plan for deployments to the Asia-Pacific region. You can read how rotations to Australia and elsewhere in the Pacific will be modeled after the “Checkered Flag” deployments. 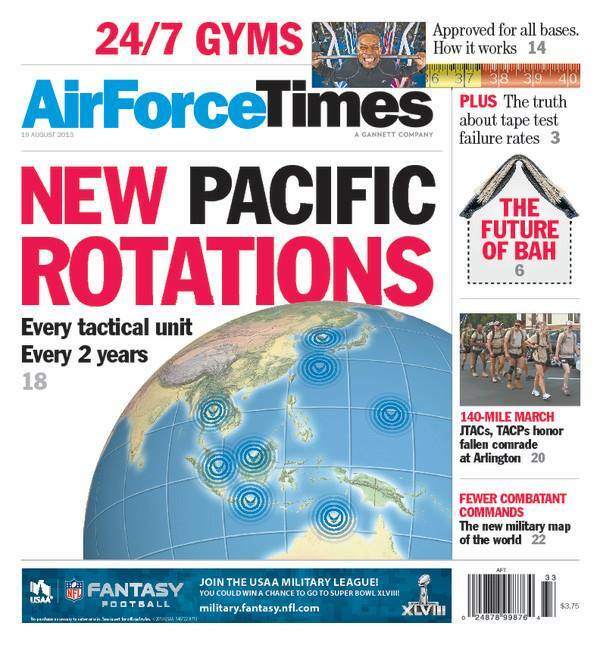 While the Air Force is increasing its presence in the region, budget cuts have forced Pacific Air Forces to curtail exercises. See which exercises have been put on hold. Facing decreasing defense budgets for the foreseeable future, the Air Force is looking into how many aircraft and bases it needs and making big changes in the active-reserve mix to save money. Meanwhile, after a five month delay that has created a backlog, periodic reinvestigations have resumed for airmen and civilians who hold Top Secret security clearances. Also this week, the Army will conduct a review of basic training to avoid the mistakes the Air Force made at Joint Base San Antonio-Lackland that led to the ongoing sexual assault investigations. And a retired Air Force lieutenant colonel has a new mission: Supplying diaper banks to help families in need.